I bought this item as a gift for my niece and her husband. The Cheese board knife set is compact and looks great when food is presented - less washing to do for them. They use the Cheese Board a lot when entertaining. This is our professional Cheese Board & Knife Set, which is perfect to cut and serve your favorite flavorful cheeses for snacking, appetizers or eating at the table. Comes with 1 Rectangular cheese knife, 1 Cheese fork, 1 cheese shovel and 1 Cheese small scimitar, this kit makes slicing easily. Plus, Knives are sturdily made with wood handles. It is so compact and convenient, making a thoughtful gift for any cheese connoisseur. Do not hesitate to buy it now! Perfect cheese board with storage. 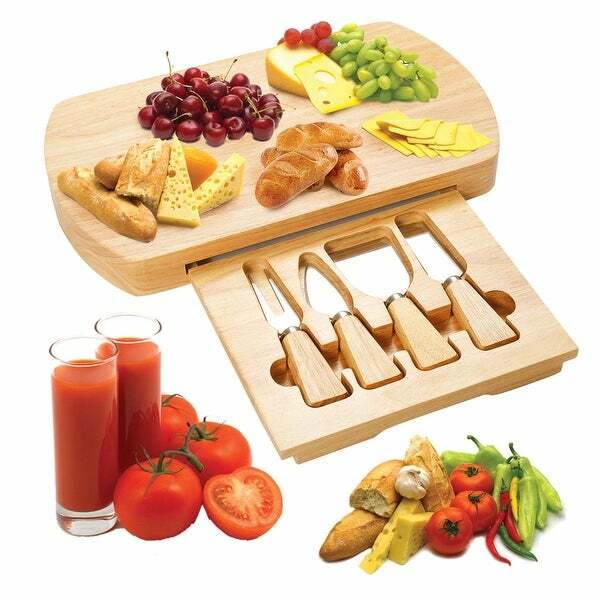 This is an attractive and convenient cutting board with very nice cheese implement tools stored in an inside drawer. It was a gift that was very much appreciated by the receiver! Love this set! Very well made, very pretty. Nice display item as well as functional. I have not received it yet. Still waiting. I am very upset by the delay in deliver.